The focaccia, not even listed on the menu, was an unexpected delight at this remake of Fremont's Via Tribunale, which also starred in warm, attentive service. The menu has changed only a little. You’ll find antipasti, salads, pastas and calzones, but the bulk of the menu is devoted to pizzas, which weren’t as good as they should be. That surprised me since one of the best things I ate here was focaccia, essentially pizza with no toppings. (It isn’t even mentioned. I just happened to see it go by.) So, take note: If you are grazing on antipasti, order the golden, dimpled flatbread with sea salt and rosemary clinging to its oiled surface. There is nothing wrong with the plain crostini, made from house-baked bread and provided gratis with some dishes, but I preferred the focaccia for soaking up the white wine, garlic and parsley broth that buoyed tiny, sweet Hama Hama clams. 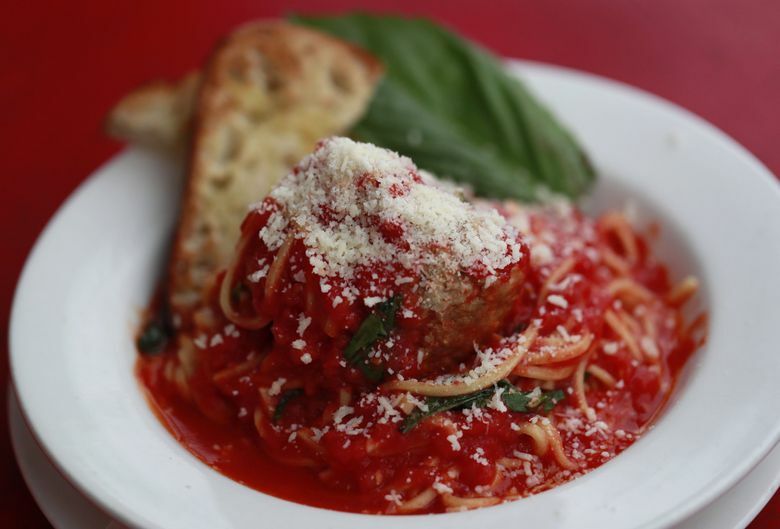 If you are craving pasta, make it capellini pomodoro, and do add a veal meatball to that tomatoey nest of al dente noodles, made by La Pasta in Wedgwood. I would skip lasagna al forno, a dense block of noodles awash in an overly sweet, not very meaty, veal ragu. The lasagna, at least, appeared to have spent significant time in the oven, unlike the Romanesco al forno, which had none of the tender sweetness you expect from an oven-roasted vegetable. My expectations ran high for the pizza. The salty, supple, very elastic focaccia dough is, after all, made with the same dough they use for the pizzas and calzones. 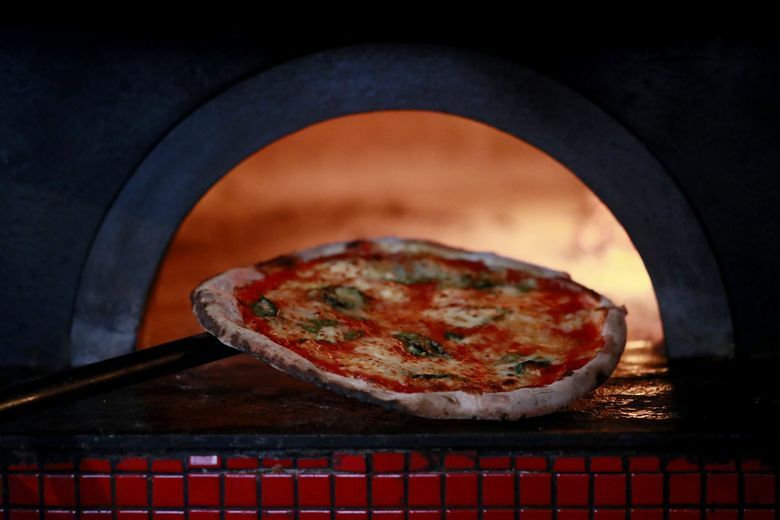 But great pizza also depends on the pizzaiolo’s skill at maneuvering pies around a domed, brick oven capable of reaching 900 degrees — so hot each pizza bakes in a couple of minutes. Neapolitan-style pies are notoriously thin-crusted and can be floppy in the center, even when they aren’t overloaded with toppings and cheese. The pizzas at In Bocca tended to be very limp and extra droopy, with crust so stretchy you really do need the shears they provide to cut slices. A knife merely tears it. The rims puffed up nicely but didn’t really blister and weren’t even faintly crusty. The not-so-crusty crust was a more serious problem for the calzones. The two I tried were the least traditional and servers struggled to describe them. Let me see if I can: For Calzone Retangolo, the dough is folded into a rectangle with chopped spinach and Romanesco filling one side, sausage and cheese filling the other. The twain won’t meet unless you cut a slice horizontally and fold it in half, which makes four layers of puffy bread to bite through. Quattro Carne is a wheel of dough with four separate, open pockets, each lined with cheese and filled with a different meat (one of them is cold prosciutto added after the bake). Both calzones had soggy bottoms and a far too extreme bread-to-filling ratio. Having wrestled with those, I was not inclined to try the Mezza Luna, a dessert calzone filled with Nutella, though it seemed popular. Instead I suggest the very acceptable tiramisu or the exceptional cannoli — cannolo more precisely, as there is just one per order, flanked by sweet, juicy amerena cherries. They are so good, think about ordering one for each diner instead of sharing. Lupo’s deep, narrow storefront, refreshed by a new coat of paint, retains its aura of romance (just ask the couple making out in the back booth). The marble-topped bar is still up front, opposite the pizza oven, where a statue of The Infant of Prague still presides, as if he’s the patron saint of pizza. The dining area beyond feels less claustrophobic but more decadent. Candles are everywhere; wine bottles, too. A long table in an alcove framed with wine racks seats up to 14, but most of the tables are marble-topped deuces. 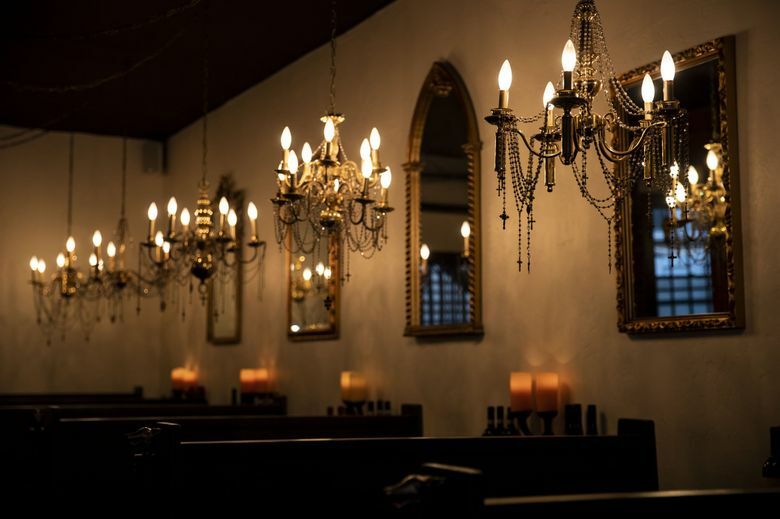 Crystal rosary beads, crucifixes dangling, are strung across chandeliers above a row of booths that have brass wolf heads affixed to the ends of their church-pew benches. For extra good luck, a tiny shrine is devoted to the Fremont Troll. 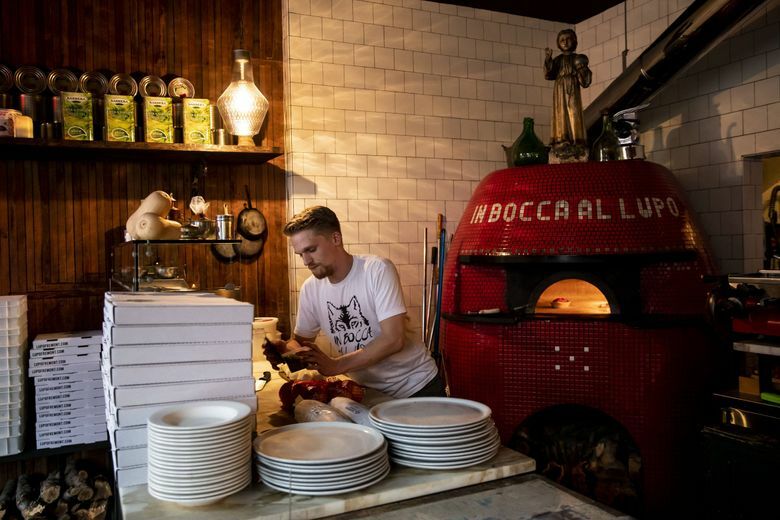 The loveliest thing about In Bocca al Lupo is the warmth and attentiveness of the staff. Harcus is a smiling, hands-on manager, greeting, serving, doing what needs doing. He notices everything. 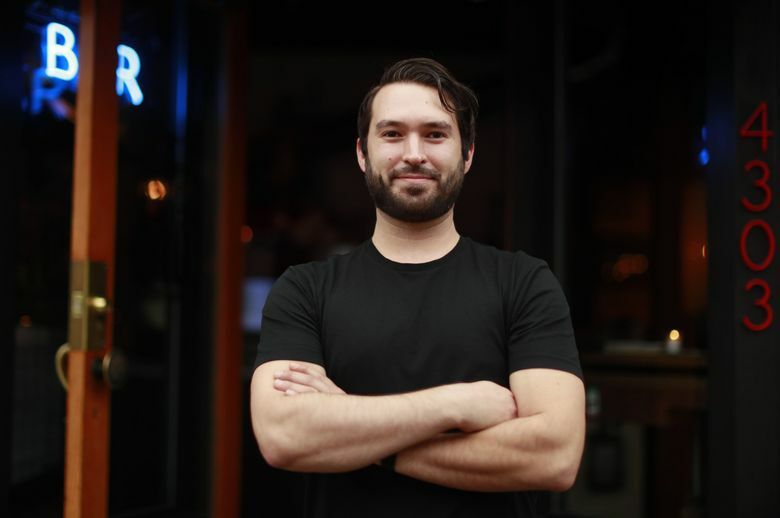 When the bartender was slammed one night, he stepped in to expedite drink orders from people perched along the front window waiting for a table. His isn’t the only familiar front-of-the-house face. Most of the staff stayed on. Bar manager Jessie Carlson is a seven-year veteran. You can tell from her jocular exchanges with customers that she knows many of them well. After one or two visits, you, too, may feel like one of the famiglia.